"An electric pressure cooker like the Instant Pot® can help during the holidays when you are pressed for stovetop or oven space. This dressing is flavorful and is sure to please the traditionalists." Turn on a multi-functional pressure cooker (such as Instant Pot(R)) and select Saute function. Melt 1 cup butter in the pot. Stir in celery, onion, sage, thyme, and pepper. Saute for 2 minutes. Pour in broth and mix well. Turn off pressure cooker. 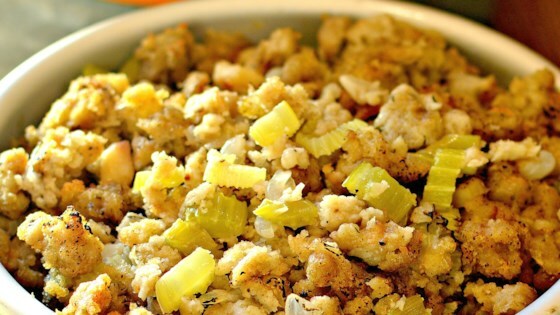 Combine stuffing and water chestnuts in a large bowl and pour in celery mixture from the pressure cooker. Stir to combine. Grease a 1 1/2-quart, 7 1/2-inch round casserole dish with 1 teaspoon butter. Spoon in stuffing mixture; do not pack in tightly. Add 1 cup of water to the pressure cooker and place a trivet in the pot. Place casserole dish on top of the trivet. Release pressure using the natural-release method according to manufacturer's instructions, 15 to 20 minutes. Substitute low-sodium turkey broth for the chicken broth if preferred. Use up to 2 cups of stock for more moisture. Serve as is or place in the oven and bake until top is slightly browned.